There are many ways to connect at Bible EFC. Whether it is Sunday, Wednesday or one of our quarterly gatherings. Watch the calendar for upcoming events. We encourage everyone to get connected with a group to continue to grow in His word and grow closer to each other. There are many ways to serve. Whether it is in our church or our community. Bible EFC is dedicated to showing God's love to our community. Our Vision is to be a community full of life- real, everyday followers of Jesus who consistently multiply communities of Christ-followers so than an increasing percentage of our mission field is connected to Jesus and others. Children- birth-5th grade gather in the Activity Center on the south side of the building. Youth- 6th-12th grades meet in the classrooms on the north side of the building. Adults- everyone is invited to the Adult Bible Fellowship located at the top of the ramp. Here is a church map to for our Sunday Morning Ministry. Scholarships are open to individuals of any age, to include adult students. They may be applied to Christian, Secular or Technical Colleges. Scholarship Applications are due May 1st. You can choose between our current sermon series or a passed series we have done. We are in the middle phases of our building remodel. Please take a look at the Renovation Update to see how God has blessed us. Let us know if you want access to a FREE resource of over 1000 bible studies for adults, youth and children! 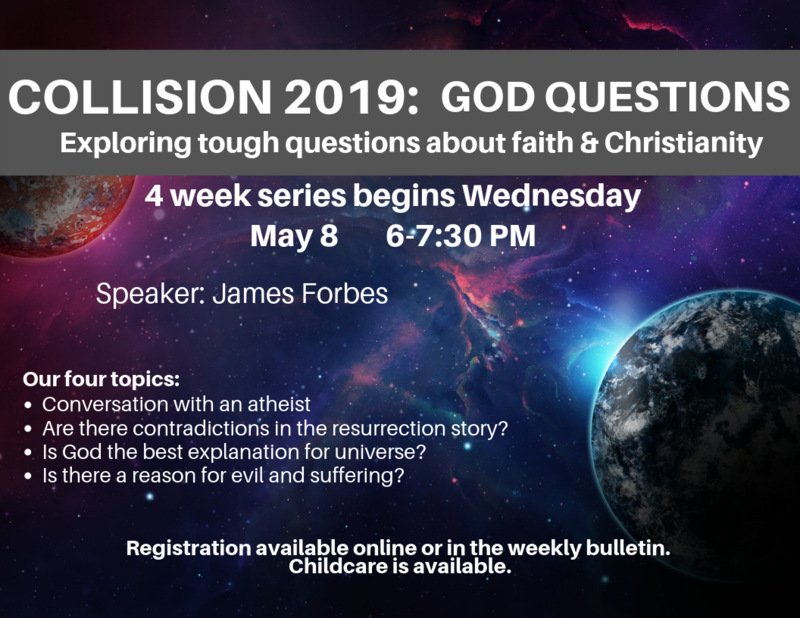 Join us for the last 4 Wednesdays in May as we talk about "God Questions". We will explore tough questions about faith and Christianity. Check out the four topics we will cover or register online.